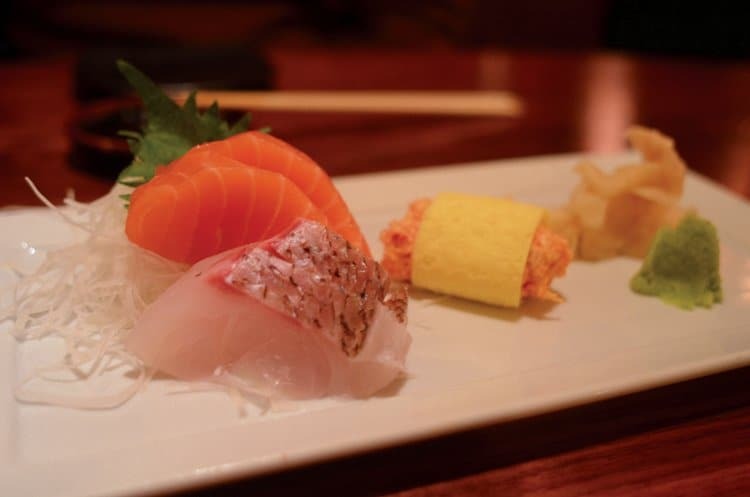 In part one, we shared our experience with three popular Manhattan restaurants, including the amazing Blue Ribbon Sushi. Let's look at a few more. 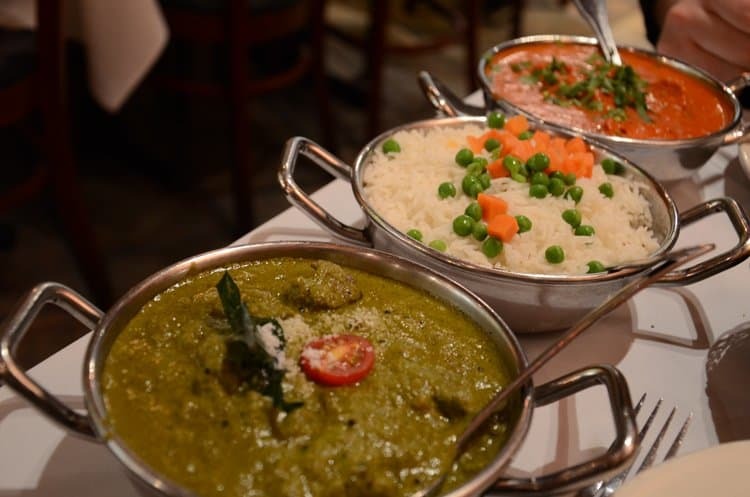 We love Indian food, especially curries. Before reaching the States, we had stopped off for a few days in London, where we always find the most delicious Indian fare. So we were attracted to Brick Lane Curry House because of its association with that famous street in London that can pretty much be thought of as an Indian cuisine marketplace. With a large traditional menu of tandoor specialities and curries that can be made with chicken, lamb, goat, fish, shrimp, paneer, tofu or vegetables, it was difficult to choose what to have for our meal at Brick Lane. We settled on the Butter Masala with chicken and goat Nilgiri Korma. The curries were delicious with generous portions of meat. 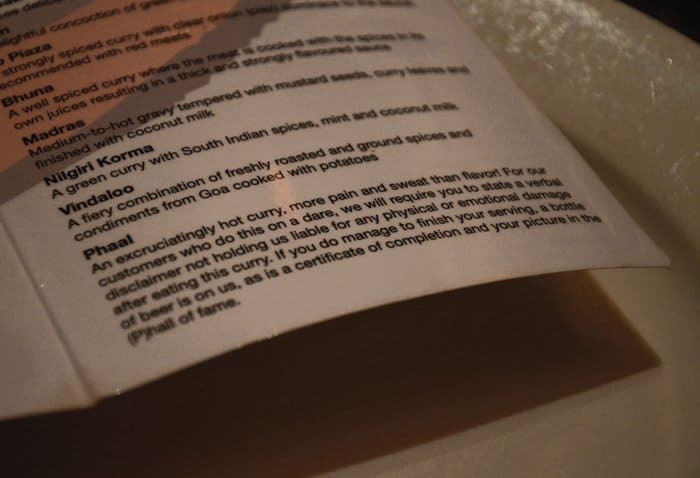 Serious lovers of spice will no doubt be intrigued by Phaal, which actually requires a disclaimer before the restaurant will serve it. Brick Lane also has locations in Midtown, the Upper East Side and New Jersey. Ever since we visited Jordan I've been obsessed with Jordanian food, along with that of Lebanon, Syria and Palestine, which have similar cuisines. So whenever I'm in a city large enough to have such diversity, I investigate our chances to enjoy one of my favourite types of food in the world. Ilili offers Mediterranean-inspired authentic Lebanese dishes in a fine dining atmosphere. Personally I prefer smaller and more "family-style" restaurants for this type of food, but the menu looked delicious and so we gave it a try. Ilili is massive inside. High ceilings and stylish decor dominate the large downstairs dining room while other guests are seated in the upstairs dining area or a smaller room adjacent to that. We ordered some hommus while we perused the menu and questioned our server about the selection of Lebanese wines on offer. We ended up sipping the 2003 Chateau Muscar red, which was a marvelous introduction to wines from this region. 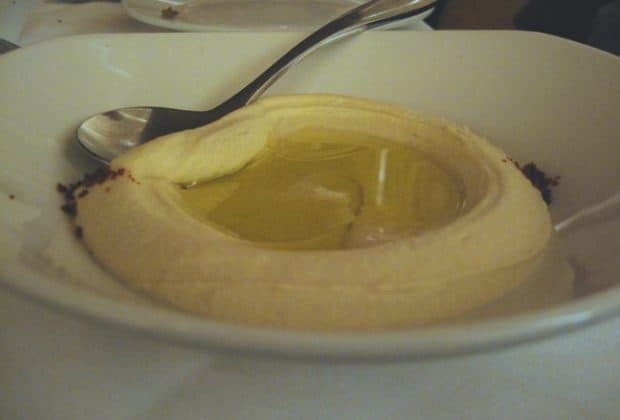 The hommus was really tasty and served with delicious Lebanese bread, which kept appearing at the table any time our basket became empty. 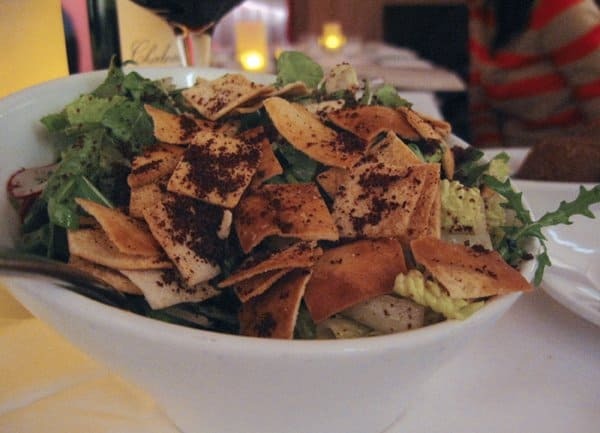 Fattoush, a tangy traditional salad, was just ok. For our main we shared the Lamb Shank Makloubeh, which was served with egglplant, spiced rice and toasted nuts. This was a very tasty dish, the lamb tender and succulent with a perfectly balanced sauce. If we didn't love Ilili, it wasn't because of the food. I'm a little hard on my Middle Eastern food, having had such amazing experiences with the cuisine when travelling in the Middle East. I have yet to find food anywhere outside the region that compares. 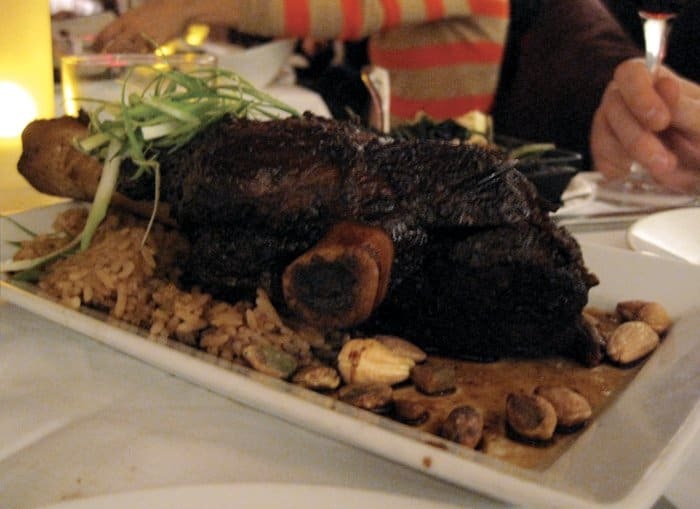 The dishes at Ilili are tasty, if not a little pricey for this kind of fare. I'm not a big fan of massive restaurants with DJs and crowds, so this was a drawback for me. But if you're after a hip and buzzing restaurant for a big night on the town, and you enjoy this type of food, you'll probably be pretty happy with Ilili. Here is a category in the city that rarely disappoints. 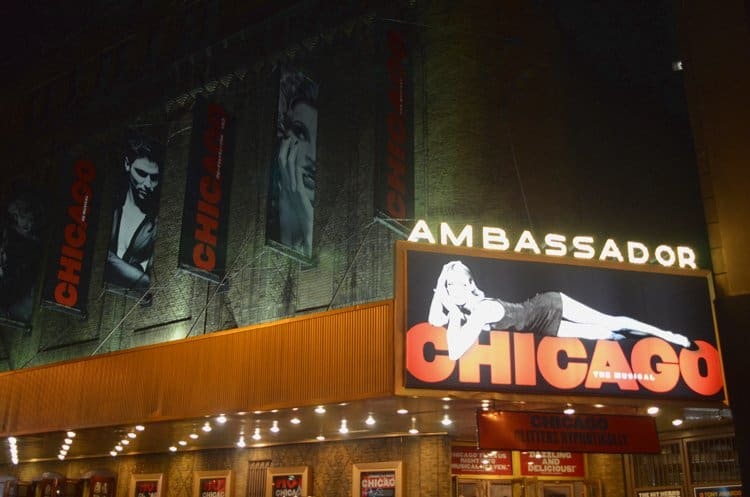 John has presented his reviews of American craft beer and we encountered some pretty awesome places to eat while trying all the great craft beer around Manhattan during his research. He'll talk more about the different bars in his posts, but I want to highlight three recommendations if you're after yummy food in an unpretentious atmosphere while out drinking on the town. 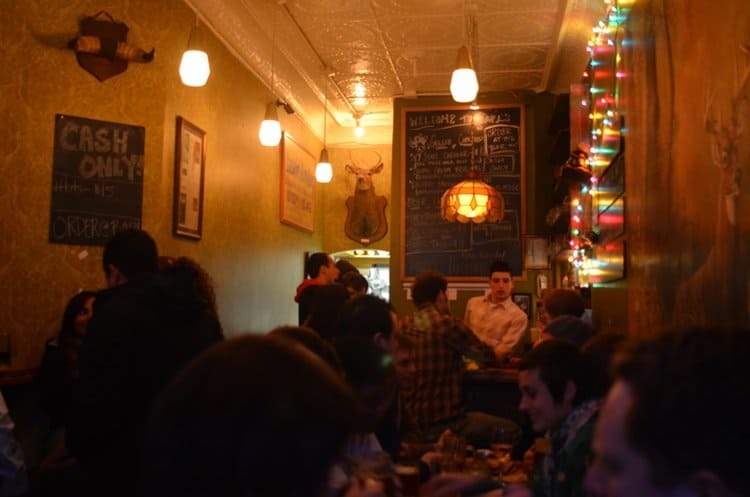 This Midtown pub promises "all American craft beer with the deer." Indeed the atmosphere inside feels like the living room at your uncle's hunting lodge in the mountains, making it the perfect setting to enjoy 16 rotating drafts of American craft beer (check their homepage for the current pours). We got a bit hungry while exploring that menu so we ordered up some bar snacks: Philly Cheesesteak Spring Rolls and the chef's special chicken and waffles, which were incredible: tender breaded chicken tenders on top of mini waffles with a delicious sweet and tangy sauce drizzled over. A further exploration of the menu revealed some pretty inventive nibbles along with sophisticated takes on the standard pub fare. Yes, a place like this does exist. As with other boutique spots devoted to the best examples of the substances they serve, our only complaint was that this place could be bigger. Gourmet cheese-based fare like Mac & Cheese with goat cheese, rosemary and shredded chicken and unique variations on the grilled cheese sandwich lead the menu. You can wash those down with delicious local beer selections. We came for the beer and stayed for the food. Truffled hand cut fries, gourmet burgers, Mac n Cheese with gruyere, cheddar, bacon and a jack mornay sauce...but don't stop there. Cooper's has a tremendous list of craft beer on offer and plenty of tasty dishes like these to accompany them. They also do brunch. Our favourite meal of the trip was, unfortunately, consumed without the presence of our cameras. While it might have been so good because of the company we enjoyed it with, I'm pretty sure it could have stood on its own as our favourite without the presence of our close friends. Local ingredients feature heavily in the dishes at the Indian Road Cafe (600 W 218th St, www.indianroadcafe.com), some from the nearby Inwood farmer’s market. We shared the Traditional Caesar Salad and Farmhouse Baked Goat Cheese, served with crusty bread, to start. Then there was joy around the table when our mains arrived, from fish to lamb to toasted paninos. The menu changes often and to sweeten it all, the cafe boasts an incredible craft beer list. Here's a fun bit of trivia: one of the owners spent a decade producing The Sopranos before deciding to give Inwood this incredible neighbourhood cafe. Thank you to The MAve Hotel for hosting us during our time in New York City. Looks real yum. Enjoying ..
Glimpses of the curries and hummus have my stomach growling! One of my favorite Lebanese restaurants is actually in Heidelberg, Germany. How much time did you spend in Jordan? We were only there a week, Tricia – wish we had longer! LOVE the sound of the beer and cheese place!! More yummy reasons to go back to NYC!